The spread of highly questionable practices — including coercion of destitute pregnant women — in the anti-abortion movement’s “crisis counseling” centers. Carol Jordan, a 32-year-old pharmacy technician, was living in Greenville, South Carolina, in 1999 when she became pregnant. She'd already decided against abortion, but she was struggling financially and her boyfriend was unsupportive. Looking through the Yellow Pages for help, she spotted an ad under “crisis pregnancies” for Bethany Christian Services. Within hours of calling, Jordan (who asked to be identified with a pseudonym) was invited to Bethany's local office to discuss free housing and medical care. Bethany, it turned out, did not simply specialize in counseling pregnant women. It is the nation's largest adoption agency, with more than eighty-five offices in fifteen countries. When Jordan arrived, a counselor began asking whether she'd considered adoption and talking about the poverty rates of single mothers. Over five counseling sessions, she convinced Jordan that adoption was a win-win situation: Jordan wouldn't “have death on her hands,” her bills would be paid and the baby would go to a family of her choosing in an open adoption. She suggested Jordan move into one of Bethany's “shepherding family” homes, away from the influence of family and friends. 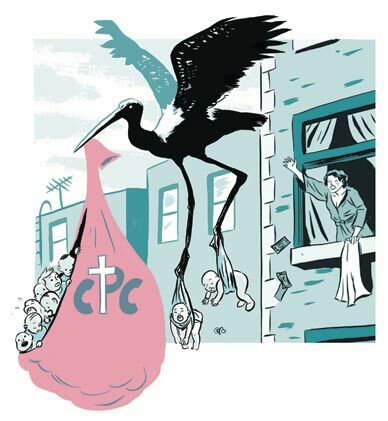 Crisis pregnancy centers (CPCs), the nonprofit pregnancy-testing facilities set up by antiabortion groups to dissuade women from having abortions, have become fixtures of the antiabortion landscape, buttressed by an estimated $60 million in federal abstinence and marriage-promotion funds. The National Abortion Federation estimates that as many as 4,000 CPCs operate in the United States, often using deceptive tactics like posing as abortion providers and showing women graphic antiabortion films. While there is growing awareness of how CPCs hinder abortion access, the centers have a broader agenda that is less well known: they seek not only to induce women to “choose life” but to choose adoption, either by offering adoption services themselves, as in Bethany's case, or by referring women to Christian adoption agencies. Far more than other adoption agencies, conservative Christian agencies demonstrate a pattern and history of coercing women to relinquish their children. Bethany guided Jordan through the Medicaid application process and in April moved her in with home-schooling parents outside Myrtle Beach. There, according to Jordan, the family referred to her as one of the agency's “birth mothers”--a term adoption agencies use for relinquishing mothers that many adoption reform advocates reject--although she hadn't yet agreed to adoption. “I felt like a walking uterus for the agency,” says Jordan. Jordan was given scrapbooks full of letters and photos from hopeful adoptive parents hoping to stand out among the estimated 150 couples for every available baby. Today the “birthmother letters” are on Bethany's website: 500 couples who pay $14,500 to $25,500 for a domestic infant adoption, vying for mothers' attention with profuse praise of their “selflessness” and descriptions of the lifestyle they can offer. Jordan selected a couple, and when she went into labor, they attended the birth, along with her counselor and shepherding mother. The next day, the counselor said that fully open adoptions weren't legal in South Carolina, so Jordan wouldn't receive identifying information on the adoptive parents. Jordan cried all day and didn't think she could relinquish the baby. She called her shepherding parents and asked if she could bring the baby home. They refused, chastising Jordan sharply. The counselor told the couple Jordan was having second thoughts and brought them, sobbing, into her recovery room. The counselor warned Jordan that if she persisted, she'd end up homeless and lose the baby anyway. The next morning, Jordan was rushed through signing relinquishment papers by a busy, on-duty nurse serving as notary public. As soon as she'd signed, the couple left with the baby, and Jordan was taken home without being discharged. The shepherding family was celebrating and asked why Jordan wouldn't stop crying. Five days later, she used her last $50 to buy a Greyhound ticket to Greenville, where she struggled for weeks to reach a Bethany post-adoption counselor as her milk came in and she rapidly lost more than fifty pounds in her grief. Jordan isn't alone. On an adoption agency rating website, Bethany is ranked poorly by birth mothers. Its adoptive parent ratings are higher, although several adopters described the coercion they felt “our birth mother” underwent. But neither is Bethany alone; in the constellation of groups that constitute the Christian adoption industry, including CPCs, maternity homes and adoption agencies, Bethany is just one large star. And instances of coercion in adoption stretch back nearly seventy years. Ann Fessler, author of The Girls Who Went Away: The Hidden History of Women Who Surrendered Children for Adoption in the Decades Before Roe v. Wade, has meticulously chronicled the lives of women from the “Baby Scoop Era”: the period from 1945 to 1973, when single motherhood was so stigmatized that at least 1.5 million unwed American mothers relinquished children for adoption, often after finishing pregnancies secretly in maternity homes. The coercion was frequently brutal, entailing severe isolation, shaming, withholding information about labor, disallowing mothers to see their babies and coercing relinquishment signatures while women were drugged or misled about their rights. Often, women's names were changed or abbreviated, to bolster a sense that “the person who went away to deliver the baby was someone else” and that mothers would later forget about the babies they had given up. In taking oral histories from more than a hundred Baby Scoop Era mothers, Fessler found that not only was that untrue but most mothers suffered lifelong guilt and depression. In 1984 Leslee Unruh, founder of Abstinence Clearinghouse, established a CPC in South Dakota called the Alpha Center. The first center had opened in 1967, but in 1984 Unruh's CPC was still a relatively new idea. In 1987 the state attorney's office investigated complaints that Unruh had offered young women money to carry their pregnancies to term and then relinquish their babies for adoption. “There were so many allegations about improper adoptions being made and how teenage girls were being pressured to give up their children,” then-state attorney Tim Wilka told the Argus Leader, that the governor asked him to take the case. The Alpha Center pleaded no contest to five counts of unlicensed adoption and foster care practices; nineteen other charges were dropped, including four felonies. But where Unruh left off, many CPCs and antiabortion groups have taken up in her place. It's logical that antiabortion organizations seeking to prevent abortions and promote traditional family structures would aggressively promote adoption, but this connection is often overlooked in the bipartisan support that adoption promotion enjoys as part of a common-ground truce in the abortion wars. In President Obama's speech at Notre Dame, he suggested that one solution to lowering abortion rates is “making adoption more available.” And in a recent online debate,Slate columnist William Saletan and Beliefnet editor Steven Waldman proposed that unmarried women be offered a nominal cash payment to choose adoption over abortion as a compromise between prochoice and prolife convictions. Such was the case for Karen Fetrow, a Pennsylvania mother who relinquished her son in 1994 through a Bethany office outside Harrisburg. Fetrow, a formerly pro-adoption evangelical, sought out a Christian agency when she became pregnant at 24. Although Fetrow was in a committed relationship with the father, now her husband of sixteen years, Bethany told her that women who sought to parent were on their own. Although for thirteen years Fetrow couldn't look at an infant without crying, she continued to support adoption and CPCs. But when she sought counseling--a staple of Bethany's advertised services--the director of her local office said he couldn't help. When her son turned 5, she stopped receiving updates from his adoptive parents, although she'd expected they would continue until he was 18. She asked Bethany about it, and the agency stalled for three years before explaining that the adoptive parents had only agreed to five years of updates. Fetrow complained on Bethany's online forum and was banned from the site. Shortly after Fetrow was banned from Bethany's forum, the local Bethany office attempted to host a service at her church, “painting adoption as a Christian, prolife thing.” At a friend's urging, Fetrow told her pastor about her experience, and after a meeting with the Bethany director--who called Fetrow angry and bitter--the pastor refused to let Bethany address the congregation. But Fetrow's pastor seems an exception. In recent years, the antiabortion push for adoption has been taken up as a broader evangelical cause. In 2007 Focus on the Family hosted an Evangelical Orphan Care and Adoption Summit in Colorado Springs. Ryan Dobson, the adopted son of Focus founder James Dobson, has campaigned on behalf of CHFS and Unruh's Alpha Center. Last year 600 church and ministry leaders gathered in Florida to promote adoption through the Christian Alliance for Orphans. And a recent book in the idiosyncratic genre of prolife fiction, The River Nile, exalted a clinic that tricked abortion-seeking women into adoption instead. In 1994 the Village Voice investigated several California CPCs in Care Net, the largest network of centers in the country, and found gross ethical violations at an affiliated adoption agency, where director Bonnie Jo Williams secured adoptions by warning pregnant women about parenthood's painfulness, pressuring them to sign papers under heavy medication and in one case detaining a woman in labor for four hours in a CPC. There were nineteen lawsuits against CPCs between 1983 and 1996, but coercive practices persist. Joe Soll, a psychotherapist and adoption reform activist, says that CPCs “funnel people to adoption agencies who put them in maternity homes,” where ambivalent mothers are subjected to moralistic and financial pressure: warned that if they don't give up their babies, they'll have to pay for their spot at the home, and given conflicted legal counsel from agency-retained lawyers. Watchdog group Crisis Pregnancy Center Watch described an Indiana woman misled into delaying an abortion past her state's legal window and subsequently pressured into adoption. Literature from CPCs indicates their efforts to raise adoption rates. In 2000 the Family Research Council (FRC), the political arm of Focus on the Family, commissioned a study on the dearth of adoptable babies being produced by CPCs, “The Missing Piece: Adoption Counseling in Pregnancy Resource Centers,” written by the Rev. Curtis Young, former director of Care Net. Young was speaking to a larger audience than the FRC faithful. Care Net runs 1,160 CPCs nationwide and partners with Heartbeat International to host a national CPC hot line. Kenny is tied to the cause as a “Bronze”-level benefactor of the National Council for Adoption (NCFA), the most prominent adoption lobby group in the country, in the company of other benefactors like Bethany; Texas maternity home giant Gladney; the Good Shepherd Sisters, a Catholic order serving “young women of dissolute habits”; and the Mormon adoption agency LDS Family Services. The federally funded NCFA has a large role in spreading teachings like these through its Infant Adoption Awareness Training Program, a Department of Health and Human Services initiative it helped pass in 2000 that has promoted adoption to nearly 18,000 CPC, school, state, health and correctional workers since 2002. Although the program stipulates “nondirective counseling for pregnant women,” it was developed by a heavily pro-adoption pool of experts, including Kenny, and the Guttmacher Institute reports that trainees have complained about the program's coercive nature. Even as women have gained better reproductive healthcare access, adoption laws have become less favorable for birth mothers, advancing the time after birth when a mother can relinquish--in some states now within twenty-four hours--and cutting the period to revoke consent drastically or completely. Adoption organizations have published comparative lists of state laws, almost as a catalog for prospective adopters seeking states that restrict birth parent rights. Among the worst is Utah. Jo Anne Swanson, a court-appointed adoption intermediary, has studied a number of cases in which women have been lured out of their home states to give birth and surrender their children under Utah's lax laws--which require only two witnesses for relinquishments that have occurred in hotel rooms or parks--to avoid interstate child-placement regulations. Some women who changed their minds had agencies refuse them airfare home. And one Utah couple, Steve and Carolyn Mintz, told the Salt Lake Tribune that the director of their adoption agency flew into a rage at a mother in labor who'd backed out of their adoption, and the mother and her infant ended up in a Salt Lake City homeless shelter. Many complaints have been lodged by birth fathers who sought to parent their children but were disenfranchised by Utah's complicated system of registering paternity. What followed, Gregory says, was “six weeks of pure hell,” as she felt her son and his girlfriend were “brainwashed” into adoption. She researched coercive adoption and retained a lawyer for her son. When the mother delivered, the attorney had Gregory notify a hospital social worker that parental rights were being contested, so the baby wouldn't be relinquished. Two days later, as the adoption agency was en route to take custody, Gregory filed an emergency restraining order. The matter had to be settled in court, where Gregory's son refused to consent to adoption. The legal bill for two weeks came to $9,000.